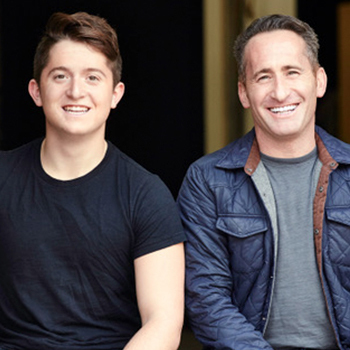 Authors, "Gen Z @ Work"
A generations expert and author of When Generations Collide and The M-Factor teams up with his seventeen-year-old son to introduce the next influential demographic group to join the workforce—Generation Z—in this essential book, the first on the subject. Based on the first national studies of Gen Z’s workplace attitudes, interviews with hundreds of CEOs, celebrities, and thought leaders on generational issues, cutting-edge case studies, and insights from Gen Zers themselves, Gen Z @ Work offers the knowledge today’s leaders need to get ahead of the next gaps in the workplace and how best to recruit, retain, motivate, and manage Gen Zers. Ahead of the curve, Gen Z @ Work is the first comprehensive, serious look at what the next generation of workers looks like, and what that means for the rest of us. Join our keynote speakers, David & Jonah Stillman – the father and son Generation Z experts, for a deeper download on what drives our future workforce and how this will impact the biomaterials industry. For nearly 20 years, David has been researching, writing, consulting, and primarily speaking about the generations for organizations ranging from the IRS to MTV. He has received rave reviews from world-renowned Fortune 100 companies including American Express, Deloitte, Walt Disney, Pepsi, PricewaterhouseCoopers, GE, Cisco Systems, Pfizer, Lockheed Martin, General Mills, 3M, Best Buy, Johnson & Johnson and many more. David coauthored the best sellers When Generations Collide and The M-Factor: How the Millennials Are Rocking the Workplace and appeared as a generational expert on CNN, CNBC, and the Today show and in national publications including TIME, The Washington Post, The New York Times, and USA Today. His creative communications work earned him numerous accolades including gold medals at the NY Film Festival, the much coveted CLIO Award, and most recently was named as one of 200 People to Watch by the Business Journal as well as one of the Power50 in his home state of MN. He’s a seventeen-year-old high school student and currently the youngest speaker on the national lecture circuit. He has already shared his insights with a variety of companies and industries as well as contributed to stories about Gen Z with MSNBC, CBS, and Fast Company. Jonah is a nationally ranked alpine snowboarder and has served as an ambassador for the international nonprofit WE, traveling to Kenya and Ecuador to build schools. Jonah and a team of peers conducted one of the first national surveys about Gen Z’s attitudes towards the workplace. The eye-opening results ignited Jonah’s interest in keeping the dialogue going. He is excited to be the voice of his generation and offer companies and organizations a heads-up about our next generation gaps.